Janine Antoni ‘Loving Care’, image sourced from Artnet. Having always used and worked with the body as a theme and a medium, it seems only natural that this year I have started to work with Performance Art. This was a movement that came into existence in the 1960s and 70s and is rooted in Conceptual Art. Performance Art is where the artist uses their own body or the body of a model to perform tasks and actions that become the artwork themselves. Famous Performance Artists include Marina Abramovic, Yoko Ono, Yves Klein, Nam June Paik, Bruce Nauman – the list is endless! Pictured above is one of my favourite artists, who has been a huge inspiration since I discovered her two years ago; Janine Antoni performing ‘Loving Care’. 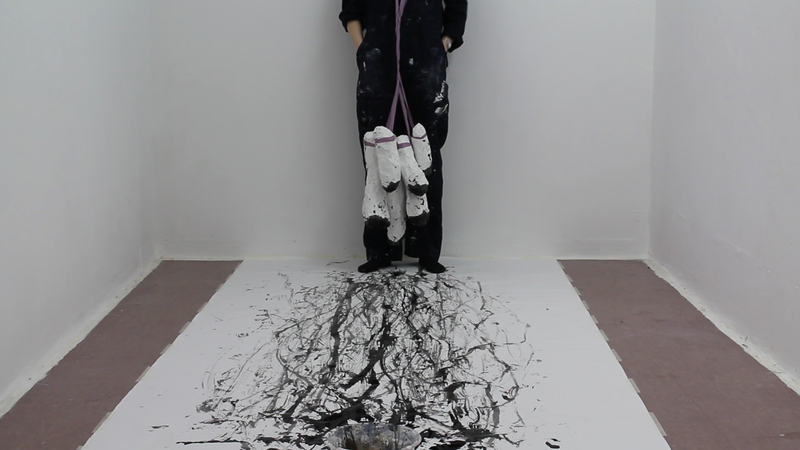 This is a work in which she dipped her hair in the hair dye and used her body as a painterly tool. This is in a sense a parody of Jackson Pollock’s painterly techniques and the male-dominated Abstract Expressionist movement, as well as being a social commentary on the domesticity of women. ‘Loving Care’ has been a piece that has stuck with me for a while now and I have always been curious to test this idea of extending the paintbrush beyond itself. I recently cut my hair and therefore thought it would be interesting to do a performance which acted as a reversal to that. I also wanted to make a gesture towards the impracticality of hair extensions and their artificial qualities. I cut my hair really short, so I wanted to extend it really long. I used the stretchy exercise bands that most people use in the gym, partially because they were a practical object to use in this instance and partially due to the presence of the gym and exercise in my work. The white objects I am using are obscure and grotesque limb-like forms that I made out of papier-mâché. This was a very laborious and time-consuming task not only because I made a lot of these objects, but also because of their drying time and formation process. However, the labour was another element to this performance. In it I am not only exploring this idea of body image through the representation of hair extensions, but I am also exploring the repetitive and mundane. Labour is an element not only in the construction of the objects, but also in creating the drawing given how many times I walked up and down the paper. There was also an element of pain present as although these objects are relatively light, when attached to your hair and roots they are less so! I had a pot of ink and water that I kept dipping these objects into and my intention was to continue until I had used this up, however the pain prevented me from doing so. It was interesting to blend such traditional art materials (cartridge paper and Indian ink) with an act that was so far-removed from conventional painting methods. This mode of working falls into the category of Action Painting, a movement that really took off in the 1960s and is something that I myself have never tried before. There have been moments and elements of it present in my work before, but never in such a direct way. Given the fact that this art form falls and touches on a lot of aspects of performance itself, costume is consequently a very important part and something I put a lot of consideration into. In some cases I have gone for the stereotypical artsy all-black ensemble, but in this instance I wanted to return to the studio aesthetic which I think tied in well with the rest of the materials I was using. As well as thinking about what I’ll put on my body for performance work, I also think about what I’ll remove. I am a complete jewellery junkie, always adorned with rings and dangly earrings! I tend to remove all of these elements for the purpose of performance work. However in this instance I kept it all on as I wanted the jewellery to be a part of the work, as an indicator of its constant presence on my body. I think for me one of the most interesting things about working with Performance Art is focusing on and thinking about the objects left behind and how they are imbued both with the trace of human presence and a past kinetic action. What’s exciting is that although the performance is an ephemeral event, the objects left behind hold so much potential for further exploration.